I sent my soul through the invisible, some letter of that afterlife to spell: and by and by my soul returned to me and answered, ‘I myself am Heaven and Hell'. A spectral camera soars languidly through a deep valley, conjuring up images of the American frontier: towering mountains, evergreen trees, and serene water lucidly captured through a wide-angle lens. Sweeping across the landscape, the camera begins to follow a tiny yellow VW Beetle making its way up a winding road carved into the steep mountain cliffs. The lens frequently relegates the car to only a fraction of the frame, revealing how minuscule the vehicle is against the grandeur on which it is trespassing. This bird’s eye chase foreshadows the events that await the Torrence family and the film’s harrowing themes of isolation and madness. After being offered The Exorcist and its sequel, Exorcist 2: The Heretic, the iconoclast filmmaker, Stanley Kubrick, declined both and opted instead to adapt a story from Stephen King’s novel, The Shining. The title sequence introduces viewers to Kubrick’s unorthodox vision of horror, as haunting landscapes and unnerving score combine to cause an ineffable unease. By discarding genre tropes such as creaking doors, spiderwebs, dark corridors, and excessive blood, the title sequence outperforms convention. The stunning mountain ranges were filmed by Greg McGillivray (from MacGillivray Freeman Films), a cameraman personally chosen by Kubrick. Stanley Kubrick: It was important to establish an ominous mood during Jack's first drive up to the hotel -- the vast isolation and eerie splendour of high mountains, and the narrow, winding roads which would become impassable after heavy snow. In fact, the roads we filmed for the title sequence are closed throughout the winter and only negotiable by tracked vehicles. I sent a second-unit camera crew to Glacier National Park to shoot the title backgrounds but they reported that the place wasn't interesting. When we saw the test shots they sent back we were staggered. It was plain that the location was perfect but the crew had to be replaced. I hired Greg McGillivray, who is noted for his helicopter work, and he spent several weeks filming some of the most beautiful mountain helicopter shots I've seen. The aerial shots share many characteristics with the hotel footage filmed using the Steadicam, a stabilizing camera mount pioneered by Garrett Brown. Kubrick’s innovative use of the Steadicam on The Shining was considered groundbreaking, and the seemingly effortless gliding motions and long takes afforded by the system closely echo the title sequence. This hitherto untested stylistic choice imbues every move of the camera with a sense of tension and dread. Unaware of what lies around the next curve in the road or hallway corridor, viewers are lured deeper and deeper into the world of the film. Unusually, the title sequence for The Shining also employs rolling credits, a design element normally reserved for end credits. When paired with the unsettling musical score, the austere Helvetica typeface — cryptically colored a hot blue — seems immediately at odds with the pristine wilderness. Dies Irae (Latin for Day of Wrath) is the name of the 13th century Gregorian chant re-envisioned by composers Wendy Carlos and Rachel Elkind for the title sequence. Their modern take establishes the haunting atmosphere using the sounds of an electronic synthesizer — a common trope in many subsequent horror films. The synth fades in and out periodically, allowing a Native American ritual hymn to enter. The shrill wail of sirens pierce the vast sky and add to the uncanny mood. 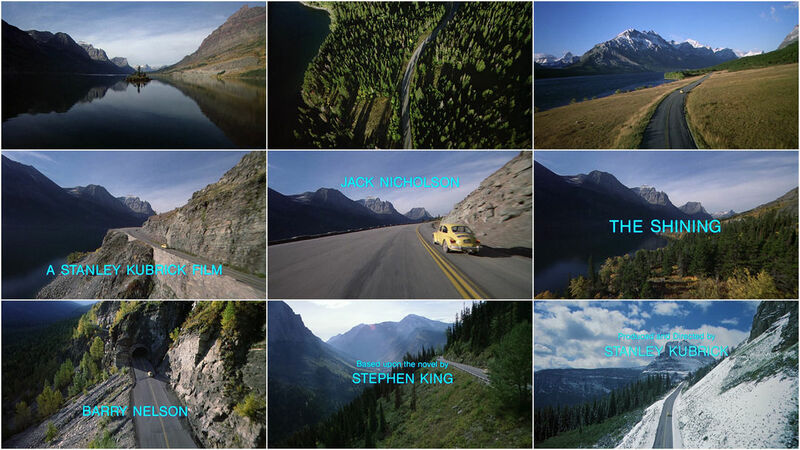 Like many of cinema’s most notable title sequences, the introduction to The Shining touches on themes later addressed in the film. For a celebrated and chronicled filmmaker such as Kubrick — known for his trenchant observations and perfectionism — myriad readings can be taken from viewing this opening. Jack Torrence’s ascent into the celestial Rocky Mountains is also a descent into the depths of his own personal hell; the lonely and strangely claustrophobic mountain road is the first of many labyrinthine constructs the film forces the Torrence family into. Here Kubrick introduces the viewer to an uncharacteristic form of horror: the domestic kind. 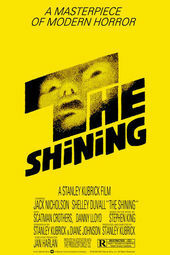 When stripped of its supernatural elements, The Shining is an all too familiar tale of abuse, alienation, and paranoia.